Published by Blackie & Son Ltd., 49 & 50 Old Bailey, London circa 1900 edition not stated. 1900. Hard back binding in publisher's original blue cloth covers, gilt lettering and 14th century dressed man to spine and upper panel, olivine page edges. Thick 8vo 7¾" x 5½" 384, 16 [page] catalogue. 8 monochrome illustrations. Former name plate dated 1916 to half-title page, 15 mm snagging of cloth to spine tip, no dust wrapper. Member of the P.B.F.A. Hard back binding in publisher's original raspberry cloth covers, black lettering and Siberian dressed man to the spine and to the upper panel. 8vo 7½'' x 5¼'' 352 pp. Colour frontispiece. Spine sun faded and in Very Good condition, no dust wrapper. Member of the P.B.F.A. Published by Hurst & Company, New York circa 1920 edition not stated. New York circa 1920. 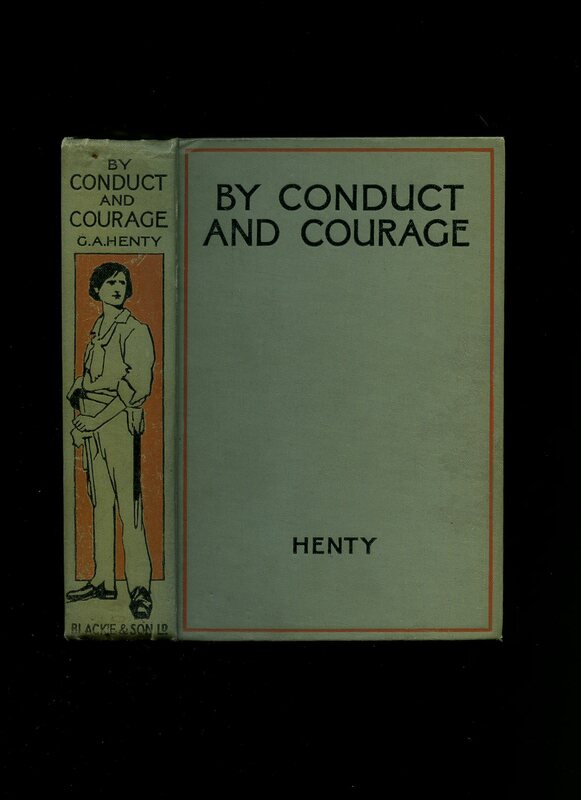 Hard back binding in publisher's original green yellow cloth covers, black lettering to the spine and the upper panel, colour illustration onlay to the front cover. 8vo 7½'' x 5¼'' 394, x [page] catalogue. Five monochrome illustrations throughout. Cheap paper browned, light rubbing to the corners and spine tips. Member of the P.B.F.A. 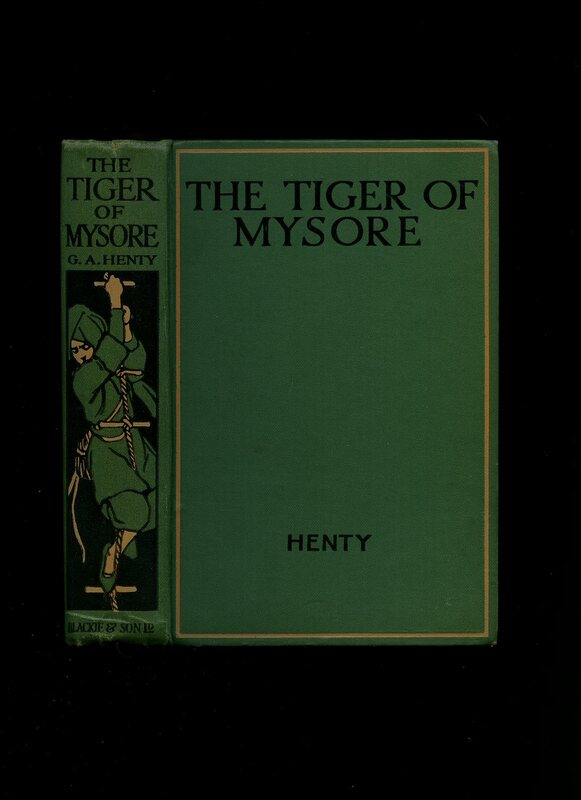 Hard back binding in publisher's original green cloth covers, black lettering to the spine and the upper panel with a man climbing down a rope ladder to the spine. 8vo 7½'' x 5¼'' 368 pp. Four monochrome illustrations and two battle plans. Light foxing to the closed page edges, Prize Plate to the front free end paper and in Very Good condition, spine not faded. Member of the P.B.F.A. 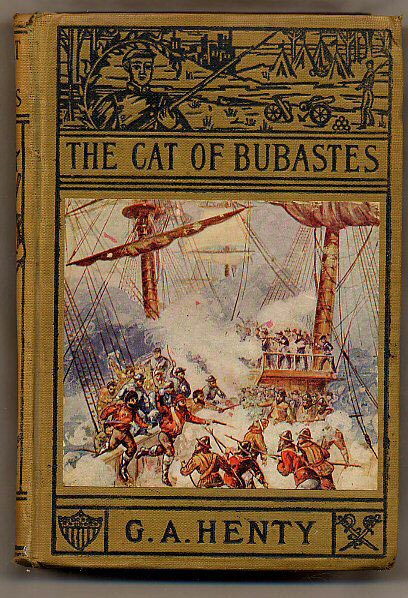 Published by Blackie & Son Ltd., 50 Old Bailey, London First Edition 1899. London 1899. 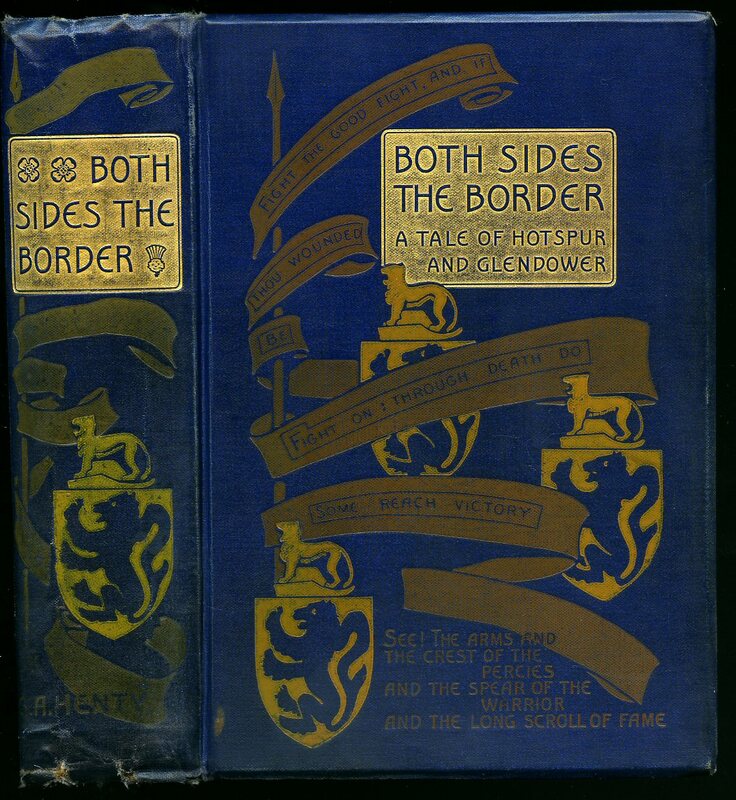 First edition hard back binding in publisher's original rich navy cloth covers, gilt title block lettering, heraldic signs and banners to the spine and the upper panel, olivine page edges, bevelled edges to the boards. 8vo 7½'' x 5¼'' 384, 32 [page] illustrated catalogue. Twelve monochrome illustrations throughout. The gatherings are slightly open and proud, two small closed tears to the foot of the spine and in Very Good clean condition. Member of the P.B.F.A. Published by Blackie & Son Ltd., 50 Old Bailey, London circa 1895 edition not stated. London circa 1895. 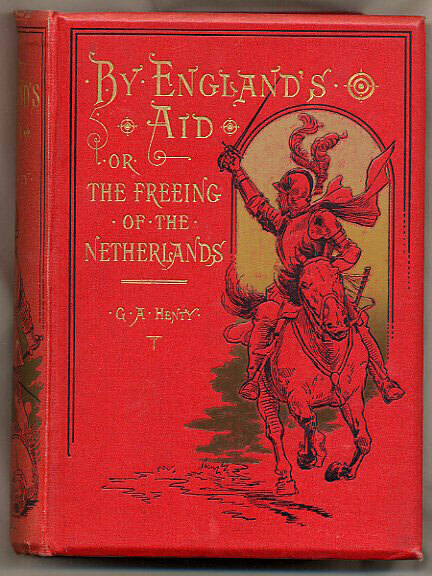 Hard back binding in publisher's original scarlet cloth covers, gilt lettering to the spine with a soldier standing astride a man on the ground, gilt lettering and soldier on horseback to the upper panel, olivine page edges, bevelled edges. 8vo 7½'' x 5¼'' 384, 32 [page] illustrated catalogue. Ten monochrome illustrations, four battle plans. Message to the half-title page, red spine very slightly sun faded, very minor rubs to the extremities and in Very Good clean and sound condition. Member of the P.B.F.A. Published by F. M. Lupton Publishing Co. New York circa 1900 edition not stated. 1900. 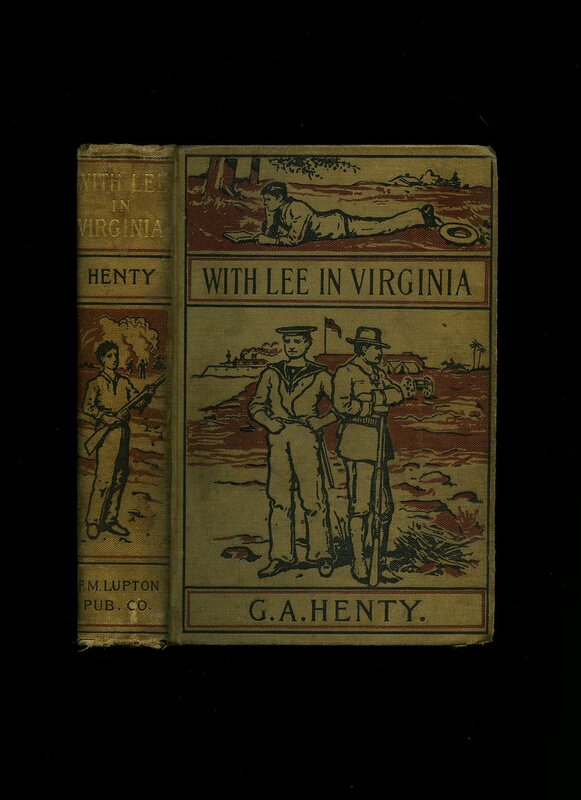 Hard back binding in publisher's original light brown cloth covers, gilt and black lettering to the spine, black lettering and three man to the upper panel. 8vo 7½'' x 5¼'' 384 pp. Monochrome illustrations. Cheap paper browning, indigo stamp to the end paper, name dated 1900 to the front free end paper. Member of the P.B.F.A. Published by Blackie & Son Ltd., 50 Old Bailey, London circa 1925 edition not stated. London circa 1925. 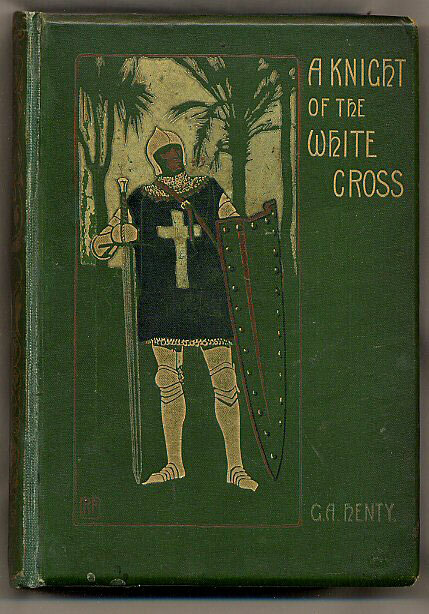 Hard back binding in publisher's original dove grey cloth covers, black lettering to the spine and the upper panel, man standing with sword to the spine. 8vo 7½'' x 5¼'' 384 pp. Four monochrome illustrations throughout. Message to the front paste down, spine tips turned-in, corners sharp and in Very Good clean condition. Member of the P.B.F.A. 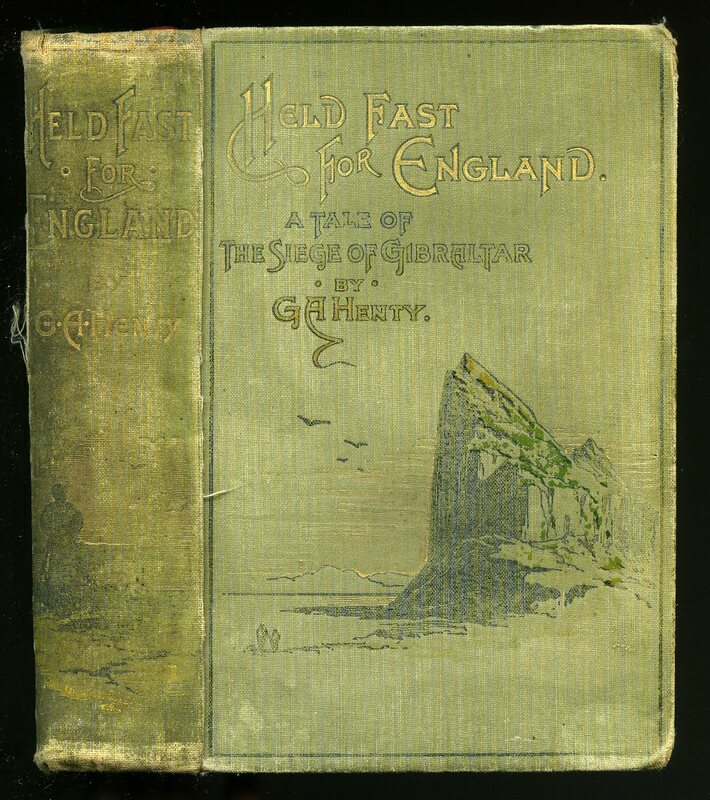 Hard back binding in publisher's original sage green cloth covers, gilt lettering to the spine and the upper panel, rock of Gibraltar illustration to the front cover, olivine page edges. 8vo 7½'' x 5¼'' 352, 32 [page] catalogue. 6 [of 9] monochrome. Reading copy with spine faded, hinges cracked. Member of the P.B.F.A. Published by Blackie & Son Ltd., 50 Old Bailey, London circa 1890 edition not stated. London circa 1890. 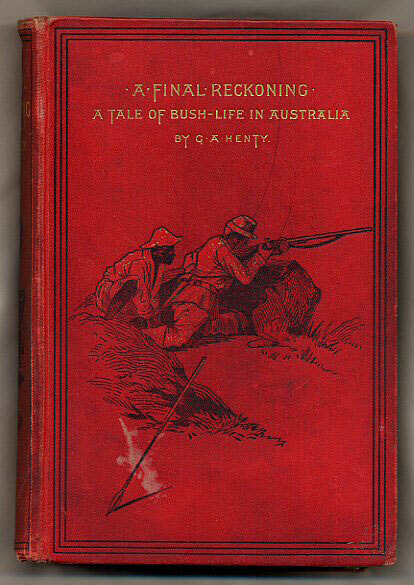 Hard back binding in publisher's original deep scarlet cloth covers, gilt lettering and bush man to the spine, gilt lettering and two men crouched behind a rock with a spear in the foreground to the upper panel, olivine page edges, Latin logo to the title page. 8vo 7½'' x 5¼'' 352, 32 [page] catalogue. Eight monochrome illustrations throughout. While the covers are secure to the text, the the bottom of the front paper gutter is torn, spine age darkened, corners rubbed. Member of the P.B.F.A. Published by Blackie & Son Ltd., 50 Old Bailey, London circa 1920 edition not stated. London circa 1920. 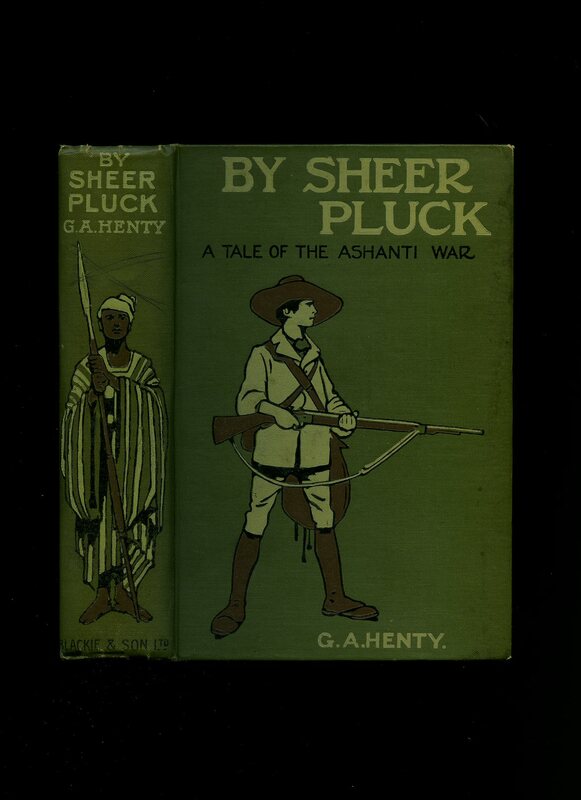 Hard back binding in publisher's original sage green cloth covers, light green lettering and warrior with spear to the spine, South African Boer type with rifle at the ready to the upper panel. 8vo 7½'' x 5¼'' 352 pp. 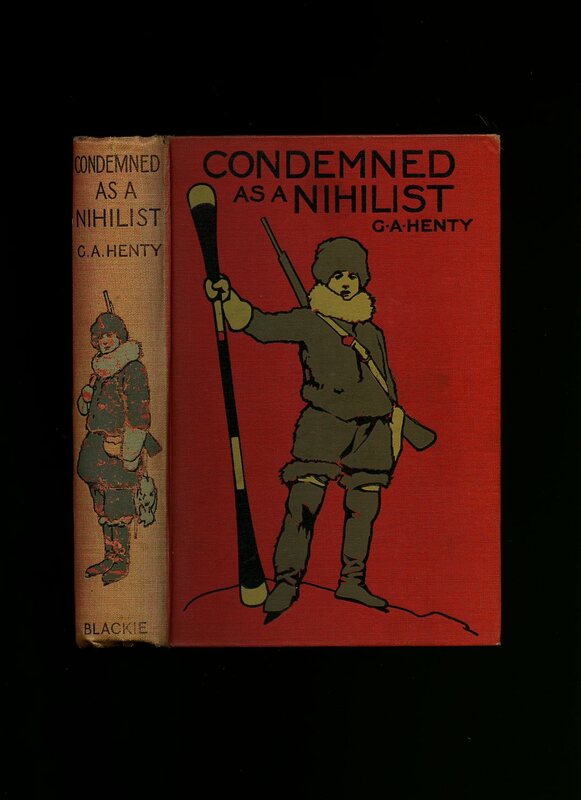 Colour frontispiece and four monochrome illustrations throughout. In Very Good clean condition with slight browning to the end papers, corners sharp and pointed. Member of the P.B.F.A. Published by Blackie & Son Ltd., 49 Old Bailey, London First Edition 1896. London 1896. 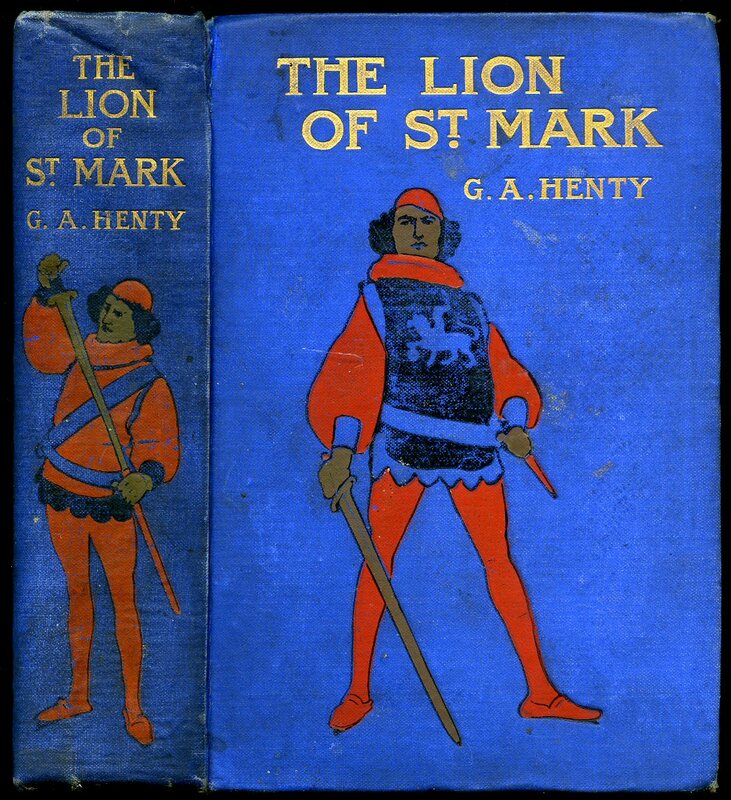 First edition hard back binding in publisher's original green cloth covers, gilt lettering and man in helmet to the spine, Knight in full armour and gilt lettering to the upper panel, olivine page edges, Latin motif to the title page. 8vo 7½'' x 5¼'' 392, 32 [page] catalogue. Double-page Plan of the Fortress and twelve monochrome illustrations throughout. Re-backed preserving the original spine, new end papers and in Very Good clean and bright condition. Member of the P.B.F.A. Published by Blackie & Son Ltd., 49 Old Bailey, London circa 1895 edition not stated. London circa 1895. 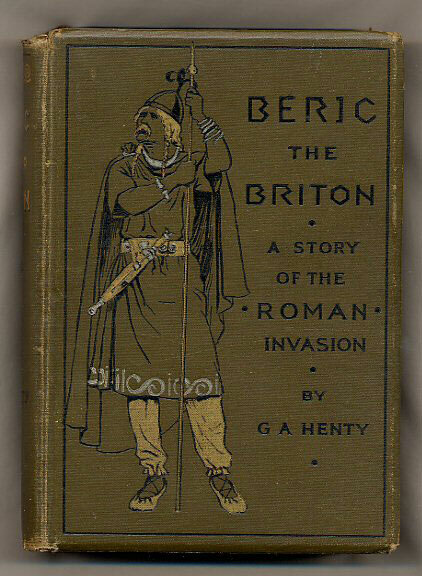 Hard back binding in publisher's original brown cloth covers, gilt lettering and two crossed daggers to the spine, black lettering and early Briton man to the upper panel, olivine page edges. 8vo 7½'' x 5¼'' 383, 32 [page] catalogue. Twelve monochrome illustrations throughout. Light message to the front free end paper, gatherings slightly loose and open, tips and corners turned-in, spine not faded or darkened. Member of the P.B.F.A. 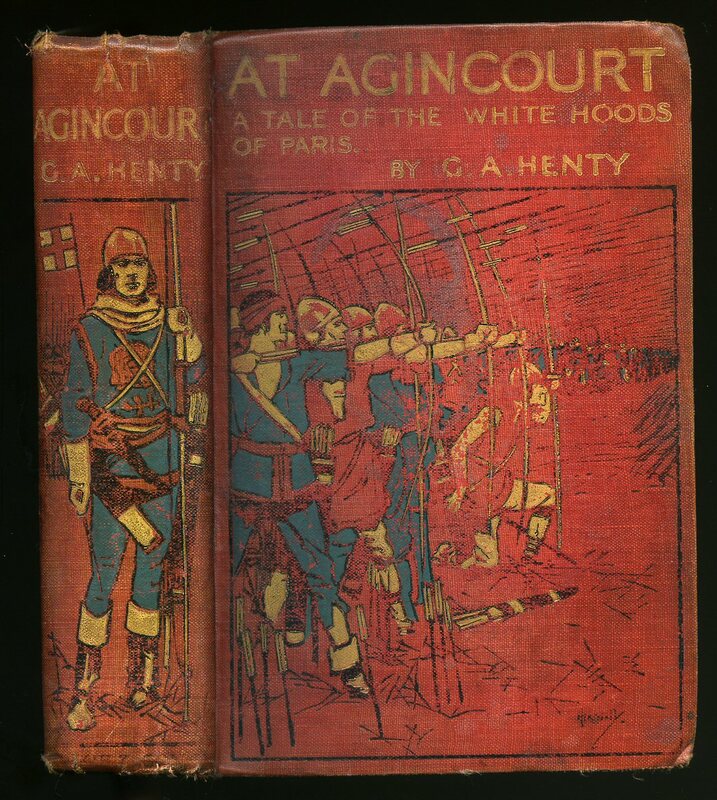 Hard back binding in publisher's original scarlet cloth covers, gilt lettering and archer to the spine, gilt lettering and a field of archer's in blue dress to the upper panel. 8vo 7½'' x 5¼'' 384 pp. Eight monochrome illustrations throughout. Reading copy with title page and two plates missing. Member of the P.B.F.A. 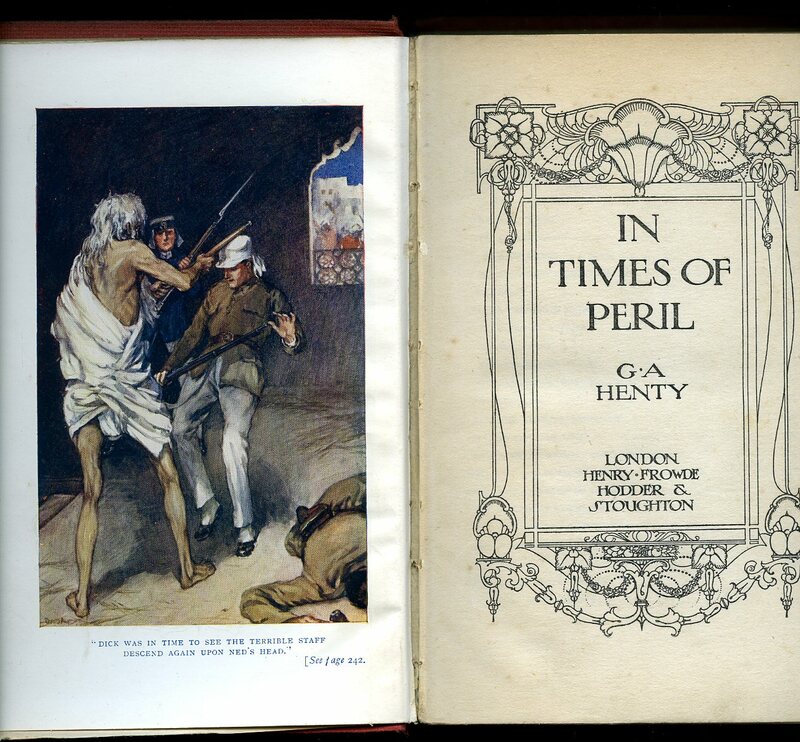 Published by Humphrey Milford Oxford University Press, London circa 1925 edition not stated. London circa 1925. Hard back binding in publisher's original strawberry cloth covers, gilt lettering to the spine. 8vo 7½'' x 5¼'' 368, 16 [page] catalogue. Colour frontispiece. Spine age faded, front end paper missing, soiling to the board edges. Member of the P.B.F.A.